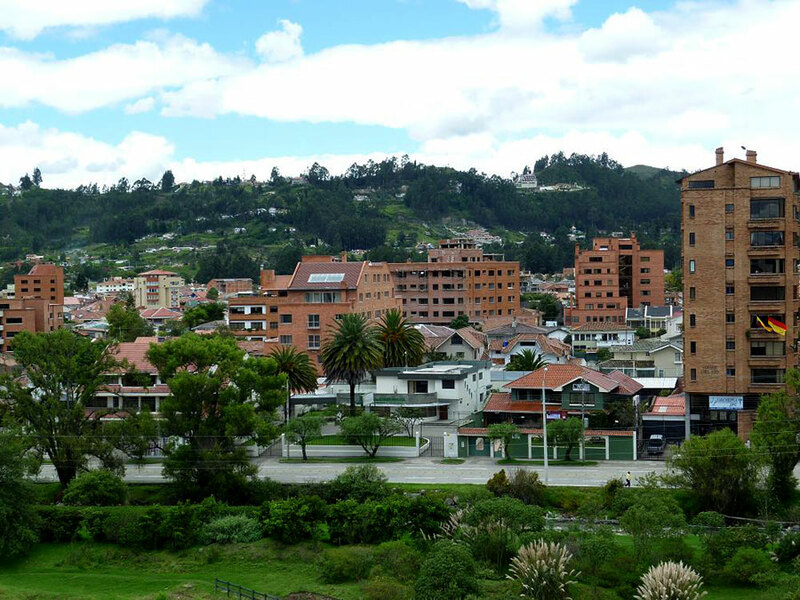 Cuenca is a great city to not only visit, live and enjoy but it is also a great base camp to the surrounding areas. The most famous day trip from Cuenca has to be Cajas National Park and for good reason too. Athough it typically rains in the afternoon so go early; dress for cooler temperatures and rain, rain, rain. Ingapirca is another popular destination located near the city of Cañar (which has a nice Sunday market). I’ve heard tour companies say there is not an English speaking guide at the ruins but this is not necessarily true. It is very easy to catch the Ingapirca bus from bus terminal in Cuenca and find a guide at the ruins. In fact we got a great guide. The general rule is for every hour on the bus you pay $1 so expect to pay about $2.50 one way to Ingapirca. I think this archaeological site is well worth the visit but I’m a former archaeologist. *Also before you can exit Cuenca’s bus terminal to get to the darn buses you have to have 10 cents to pay the revolving door to let you out. The thermal baths at Baños are very clean and enjoyable. And so close you could rent bikes and bike to it. Hilly. Be prepared to shower before you enter the baths and pay for a shower cap ($1). The infamous Chordeleg, Sigsig, Gualaceo route is touted as a great all-day excursion from Cuenca. Although I have heard mixed reviews about the Chordeleg, Sigsig, Gualaceo route. Chordeleg is best known for its silver but even the most fanatic shopper will get bored of the endless row of shops. Although I enjoyed Gualaceo’s Sunday market and river walk. I think a wonderful place to visit is Paute. A stunning bus ride, less than an hour away to a tiny agricultural town. I really enjoyed the views and the friendliness of the people. As an Asian American I have had to get used to the stares and the curious glances but in Paute I received nothing but warm greetings and smiles. Roast chicken along the way too, nice change from the beloved pigs. Bíblian is another sleepy town that has a 200 year old English-looking church worth walking to. Beautiful views of the city at the top. I’ve also heard good things about Jima for hiking and Giron for waterfalls. For more ideas I would highly recommend my friend Brian’s blog Cal’s Travels. Freebies: One of the nice things about Cuenca is there are many free events or places to visit at no cost. By popping into most restaurants or hotels you can discover a little booklet that tells you what is going on that month in the city. At Plaza de San Sebastian which is a very pleasant square in itself there is the Museo de Arte Moderno which houses contemporary art and peaceful green spaces. Along the square there is also an Italian restaurant known for it’s homemade pasta ($$$) and nice cafés, and its namesake church. 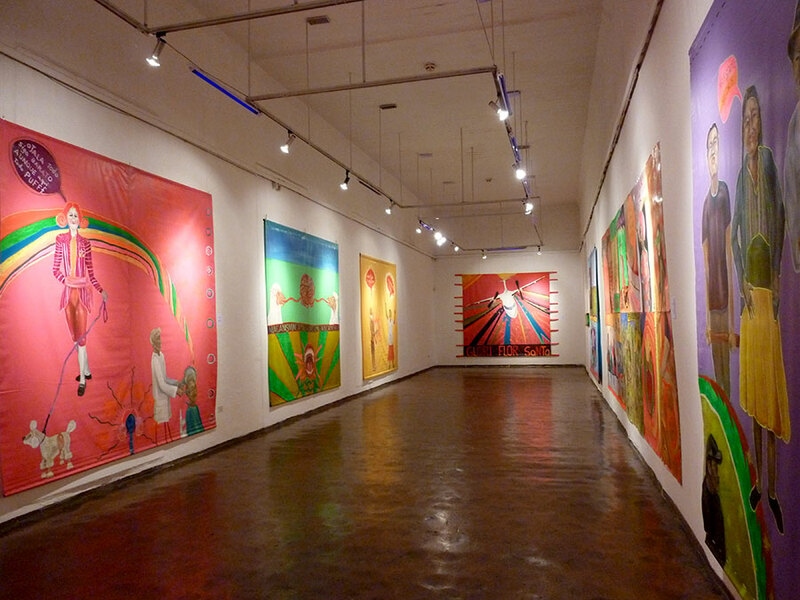 Banco Central on Calle Larga is another great museum to visit. But on Saturdays the “archaeological park” in the back Pumpapungo is free. It is a lovely and diverse garden with tropical birds, llamas and Inca and Cañar ruins. Mirador de Turi is Cuenca’s high point and can be found easily enough by walking south down Avenida Solano. It is quite the hike up but there is a path and stairs. You are basically making a straight line up with a few jogs here and there. Great views of Cuenca, church at the top. 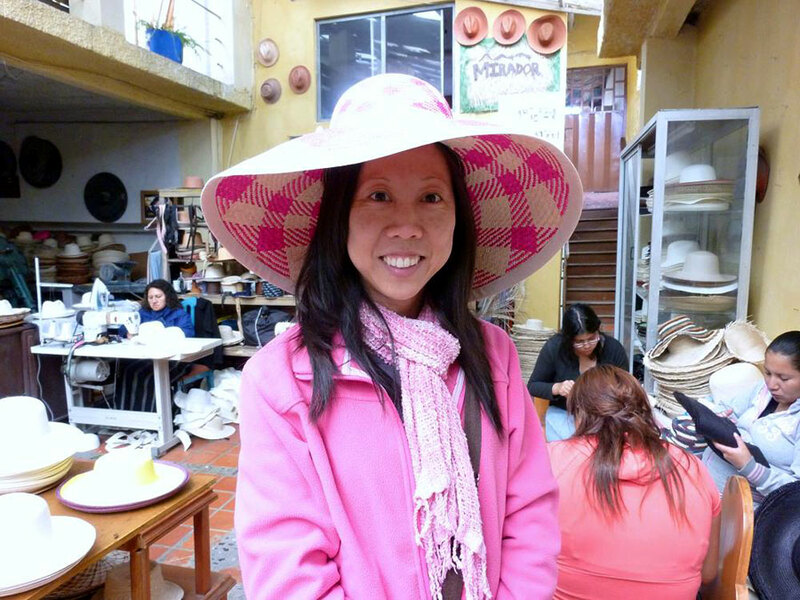 Barranco or the Panama hat museum on Calle Large is a fun museum where you can see how the famous Panama hats are made and try a few on. If you walk up the stairs at the back you’ll get a peek at the river before going through a café and then back to the museum. Me in a Panama hat! You can also walk around the city and enjoy the many churches. They aren’t always open though. But when they are you feel blessed to have caught them between closed doors. As a UNESCO site, Cuenca is constantly under construction but don’t let this prevent you from exploring the city on foot. I think one of the joys of this city is catching a glimpse of the stunning courtyards that lie beyond seemingly plain doors, admiring the vintage automobiles chugging around the town, and the colonial architecture and details. The Rio Tomebamba is another free option to enjoy. It is beautiful to walk along and visiting the various outdoor markets are other good options too. I think the 9 de Octoubre is the best to shop at. Although sitting with an ice cream from Tutto Freddos in Parque Calderon people watching is an excellent pastime too. And although this is not entirely free either, at Parque de la Madre around 7:30am you can join in the aerobics class for 35 cents. What else did I miss??? I’m sure I’ve missed something! Cuenca’s famous landmark, The Catedral Nueva. Anyone who has been following me on the missing teacher or who knows my story, knows what a uphill road it has been back to teaching. After a few attempts to stay connected with the force-field known as education, I gave in trying to get through. So I pursued writing. I shifted my focus. And for those who have tried to do something for an extended period of time with bad success knows shifting, sitting still and pausing is necessary for sanity and mental health. When I was hired as an ESL teacher here I don’t think I appreciated what I was getting back into. I mean, it was exciting to be going to South America! And teaching was the side salad. At Waldorf, I made the mistake of making teaching my main course and I wasn’t about to do that again. I was going to be involved, but removed, cautious and careful. Actually, I have no idea how I was going to be. *Sigh* But teaching took a hold of me again. This time though in a good way, I held fast to those pesky lessons of the past and moved forward as I had always hoped I would. As I get ready to leave this continent, I am touched by this opportunity and only now understand what this really means to me. This was an important moment that allowed me to free myself from the heavy chains of the past; a past that had colored my teaching world a little darker. Although, I still made the mistake of caring for my students again, I don’t know why I do this! They are not just warm bodies that fill the cold rooms of classroom learning, but vibrant personalities that make me laugh and grow. The Button Pusher: Ah, one in every class. This student knows how to make you count to 10 and relishes it. Speaks in her native tongue and from the sound of it, it ain’t good. You don’t know if it’s “cultural” or “personal” but you do know that this expletive is a “problem”. *Note: dangerous in numbers. The Tower of Babel: This student speaks in complete and coherent sentences. Sometimes. Other times, they are, you are convinced, speaking in tongues and you are wondering how they got into this level. You are an utter failure. The Writer (aka The Talent): These geniuses make you wonder why you are doing the teaching. They are creative, modest, and have been known to love The Beatles. These students are not known to be button pushers, but water testers. And because they are the talents, crushes are likely to develop. The Slider (aka Wallpaper Jorge): This student does – just – enough to get by. They write the shortest essays and speak the least amount. They magically disappear and reappear Harry Potter style. Possibly members of the Order of the Syntax. Known to whisper. The Beauty & the Beast: She’s looking at her tiny mirror and he’s looking at her. She’s applying lip gloss and he’s copying her homework. She’s color-coordinated and he’s looking through her purse or playing with her cell phone or anything he can that belongs to her. She’s got him on her lead and he knows it. So fare thee well Ecuador. Thanks for letting me in. Thank you for giving me the opportunity to fall in love with teaching again without the drama and without the distractions. I know I’ll miss the beautiful mountain landscapes, the architectural beauty, Tutto Freddos and the friends I’ve made. I’ll miss my students, too of course. And I have a feeling I’ll miss this place a lot more when I leave. So I’ll be back. After all, Cuenca desperately needs a Thai restaurant. The ever popular Barney. Weird, right? Had to snag him for a photo op. And Asian Americans look like me. Another crack at Spanish means a lot of things, including another crack at my self-confidence. I’ve started another Spanish class this week and so far it has been great. I’m surprised by what I do know and what I have remembered from my own studies. I also made the commitment to have fun. The stress of moving to another country is greatly under-appreciated. Starting over feels like building your own house. A daunting task but doable. The raw materials and blueprints are at your disposal but damn it, it’s a lot of hard work. And if you’ve been reading my blog then you know how much friends can help shoulder/lift/ease the burden. At least you know how very much I appreciate my friends. I think we forget that we are not alone. It can feel lonely especially when you compare yourself to others, when you feel as though everyone is building their house faster with seemingly less effort. Sometimes I pace back and forth in my mind over these things but then I remember that comparing myself to others does me a great disservice because I am pretending to know how things are with other people. I know this but then I forget and then life feels like the process of remembering the dance steps again. Because when I do remember I feel like dancing. I am moving at my own pace. I’ve noticed that I’ve been listening to the Dixie Chick’s The Long Way Around almost every day this week. I think I’ve been remembering not only how much I like this song but how much it relates to me. I used to think that the Allman Brother’s Ramblin’ Man was my theme song but there is something in the Dixie Chick’s lyrics that resonates within me too. No, I could not follow. Wouldn’t kiss all the asses they told me too. I’ve always found my way some how, by takin’ the long way around. . . Which reminds me of what one of my favorite artists Hunderwasser said, Something grows; then it can’t fail. Only quick things fail. You feel that they do not have that patina, the mark of evolution, the mark of age. Slow-growing trees are better than fast-growing, the wood is better, they look better. So I guess what I’m trying to say is I’m slow. And sometimes impatient. Especially when it comes to me. But I think with Spanish I will try to remember to have fun, keep it light because I’m starting to understand my tendencies; and if my path is one over the cobblestones then I better enjoy the bumps and bruises as much as I can. I’m not a natural language learner but I’m naturally persistent. 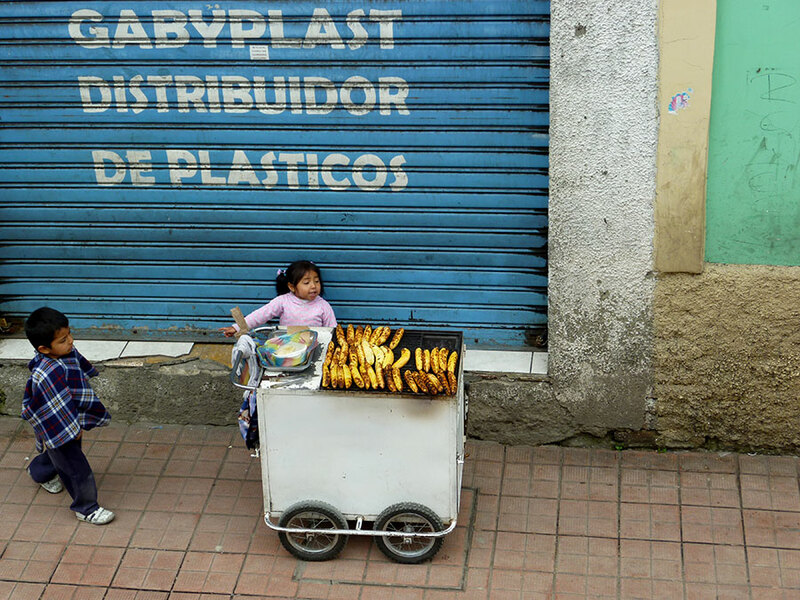 What is happening to Ecuador’s youth? It started with an advanced writing class I taught in which the students’ final work would be a research paper and presentation. I didn’t know what to expect from a particular student because she changed her topic at the last minute. Well it was damn enlightening. She talked about Ecuadorians who immigrate to the United States. And the fact that they send the same amount of money back to their families that Ecuador makes in oil exports. These statistics are probably a little old as data goes, especially in our current economy but all the same, I was surprised. But what surprised me even more were the repercussions of Ecuadorians moving to the US. The repercussions? I had never heard about the families left behind. I had only heard about how the US is overrun with illegal/legal immigrants and “American dream” stories of tenacity and successes. It was just assumed from my North American status that families on the receiving end of the money being sent back from those who had escaped to provide a better living were grateful, happy and pleased. Apparently not. It turns out that divorce rates enter the equation. As do second families (in the form of another wife, children, home); they add another x to the algebraic problem. Not to mention the children who turn themselves inside out wondering why they’ve been left behind. This seems logical, natural even but what my student did was give me in a lesson in division that I didn’t even know existed because the rest of the students seem to be very much aware of all this. But my education did not stop there as I thought it would. It was unfortunate, etc but I didn’t expect to hear about it again until a colleague explained to me another facet to this issue. I’m not sure how we got on this topic but she shared with me what she had learned from her students. There are two gangs in Cuenca who’s names escaped her but let’s call them M and N. M’s seek out very depressed teens and teach them to cut themselves. They typically have slash marks up their arms. You have to remember this is a Catholic society that is extremely family-centric. Sundays are family days. Everyone eats dinner with their family on a daily basis. They spend holidays, festivals, celebrations and vacations with each other. You live with your family until you are married. Mothers and daughters walk arm in arm all over town. It’s common to hear from teenage girls that their mother is their best friend. And I imagine there is a similar bond between the fathers and sons. I can’t imagine what it would feel like to grow up in the shadow of happy parents w/ their children celebrating together or having dinner every night. Sure these children are left with an extended family member like an uncle or grandmother but it is not the same. Sometimes these cousins don’t want the children or discipline them with a neglectful hand. This is the perfect example of how money thrown at a situation doesn’t solve anything. These children know that their parents are off making money and sending it “home” for them but I think they would be happier if their parents were with them instead. I don’t know but hearing about the families left behind makes me wonder what some of their stories are. As an orphan you are left oftentimes to your imagination as to what happened to your parents. Or if you know they left you, at least you are left with the confirmation that you have been utterly abandoned. But for these children they are on a loose tether of sorts. Their parents are providing for them in a materialistic sense perhaps with promises to come back or send for them. But if their parents are in the US illegally then it becomes a visa nightmare to try to reunite with their children. I’m sure the parents over there are doing what they feel is best. And I know gang situations are a problem everywhere around the world. But I am not all over the world, I am here and I wonder what will happen to Ecuador’s youth.